AVIVA provides comprehensive audio visualoroduction services management with affordable, pro-grade audio visual equipment and professional AV tech services to conferences and conventions throughout Virginia and the mid-Atlantic. Of course, Aviva Rentals carries the JBL Eon 10-inch and 15-inch powered speakers, the most popular premium-powered speaker in the industry. AVIVA also carries the JBL 18-inch powered, sub-woofer speaker and the KW181 18" active Subwoofer, both for when you need to pump up the jam. The JBL 10-inch or 15-inch speakers are usually more than adequate to handle an averaged-sized meeting or event that requires audio simply for voice. 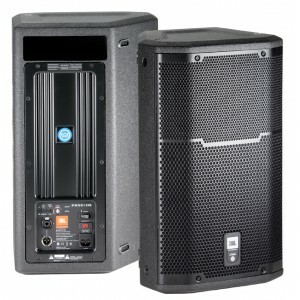 However, If you're looking for an active loudspeaker that can fill multiple roles, grab a JBL PRX612M or two. These excellent-sounding 1,000-watt, 2-way speakers make fantastic mains for small and midsized gigs. They are also excellent solutions for poor acoustical environments such as coffee shops, halls, gymnasiums, and clubs. For larger-scale setups, you can lay PRX612Ms on their sides and switch them from Full Range to Monitor mode; they become great active monitoring wedges. As with the rest of JBL's PRX600 series speakers, the 12" PRX612M loudspeaker features highly efficient Class D technology and advanced cabinet design. When you need to tackle the sound reinforcement challenges that plague almost any live sound environment - high ambient noise levels, poor sound diffusion, and loud stage volumes - JBL's PRX600 series loudspeakers give you the tools you need to go beyond the quality your audience will expect. Lighter cabinets (only 34.5 lbs. for the 1,000-watt PRX612M!) make loading and unloading easier than before, and tour-tested rugged designs won't let you down when your sound matters most. If you're looking for a portable active subwoofer with plenty of power to spare, check out JBL's PRX618S. As with the rest of JBL's PRX600 series, the 18" PRX618S subwoofer features highly efficient Class D technology and an advanced cabinet design. When you need to tackle the sound reinforcement challenges that plague almost any live sound environment - high ambient noise levels, poor sound diffusion, and loud stage volumes - JBL's PRX600 series loudspeakers give you the tools you need to go beyond the quality your audience will expect. Lighter cabinets (only 70 lbs. for the 600-watt PRX618S!) make loading and unloading easier than before, and tour-tested rugged designs won't let you down when your sound matters most. In our ongoing effort to afford our customers the widest selection of audio visual equipment rentals. Aviva now offers The QSC K-Series of loudspeakers, including the K12 2-way 12" active loudspeaker a 12" 2-way PA speaker system boasting a 1,000 W Class D power module and approximately 75 degree horizontal and vertical coverage, the K8 2-way 8" powered loudspeaker featuring a 1000-watt Class-D power module, and extremely compact size so as not to intrude on audience sightlines and the KW181 18" active Subwoofer. 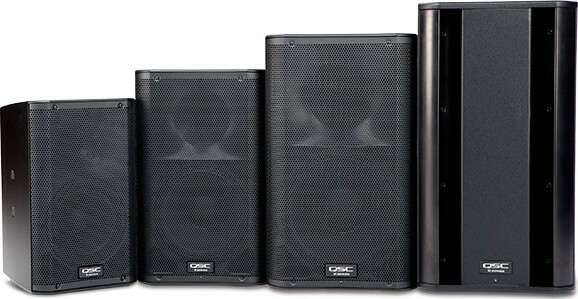 The QSC K-Series is quite simply the new standard in lightweight powered loudspeaker systems. QSC's team of amplifier engineers have created a new standard in Class D power modules unparalleled in the industry. Breaking from the traditional loudspeaker paradigm, every model is fitted with the identical 1.75" HF device (fullrange models) and woofers of the same high quality for unparalleled performance, regardless of speaker size. If you are a professional musician, in need of some speakers for your next live performance, the QS K-Series will provide you with the fidelity you need whether playing a small, intimate venue or a larger theater venue. 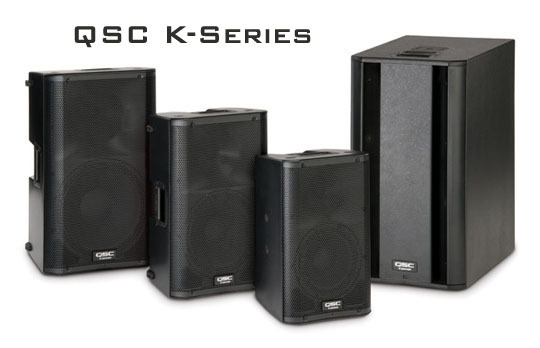 Just added to Aviva's inventory of sound reinforcement rental equipment, the QSC K.2 Series. The K.2 Series is packed with more of everything. Double the power. Higher SPL. Greater low-frequency extension. Experience sublime clarity, thanks to the power boost and improved DSP management, while the higher SPL and greater bass extension injects your performance with pulse-quickening vigor. Optimize your system with user-adjustable DSP parameters and presets. Dual pole cups (straight-firing and down-tilt) replace the previous QSC K-series generation&apos;s tilt-direct single cup for added stability. 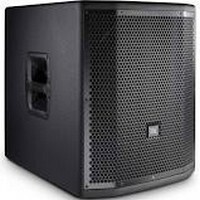 With hefty power, superior fidelity, and a 3-input mini-mixer, this speaker cabinet is a rugged and capable performer in small PA and AV applications and sound systems.The JBL EON10-G2 weighs in at only 10.4 kg (23 lbs) but proves that you don't need size and weight to get quality. With 175 watts of bi-amplified power (125 watts for low frequencies and 50 watts for high frequencies) the EON10-G2 is the choice for moderate level performance. The PA speaker's built-in amplifier delivers 125W for driving the improved 10" woofer with neodymium magnet while 50W drive the 1" compression driver with titanium diaphrage and ferro-fluid cooling resulting in high-quality sonic performances. Combined with the EONSUB G2 powered Subwoofer the EON10 offers a full-range PA system for small to medium events and venues. Need to pump up the jam? 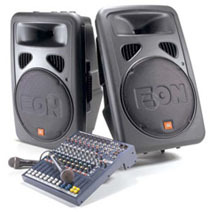 The EON 518S from JBL is a professional-quality front-firing subwoofer ideal for live sound reinforcement, music playback in educational or institutional venues, and more. The compact enclosure houses an 18" neodymium driver, powered by a Class-D 500W digital amplifier to provide strong, clear bass without distortion. The subwoofer has XLR inputs and loop-thru connectors, as well as a 1/4 inch speaker input. A polarity switch is provided to address phasing issues, and a high-pass filter is available on the loop-thru outputs. An integrated pole mount socket lets you easily mount a loudspeaker on top of the subwoofer, while built-in handles with rubber grips provide a comfortable way to transport the unit. The JBL EON518S is an 18 inch, direct-radiating, high performance powered compact subwoofer speaker system designed to extend low frequency performance of any EON system. 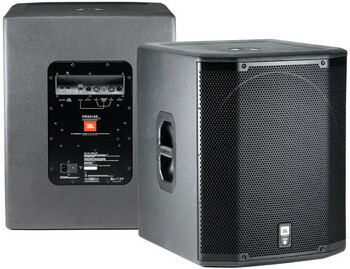 The JBL subwoofer also offers the convenience of an integrated crossover and stereo loop-thru capability. The EON518S is comprised of a 460 mm (18 inch) Differential Drive woofer driven by a 500W Class-D digital amplifier. The amplifier input panel offers stereo or mono line level inputs via balanced XLR connectors as well as a single channel speaker level input via a 1/4 inch TS phone jack. Signal processing, crossover functionality and limiting for the system is integrated into the input section functionality. Overall subwoofer input sensitivity is controlled by a single easy-grip knob and a simple switch enables polarity reversal for sub/satellite system optimization. It's signal present and limit lights indicate performance status and JBL provides an additional switch to kill the illuminated logo in theater applications. The speaker enclosure has been engineered for maximum performance and absolute minimum size. Constructed of 18 mm plywood it is coated in JBL's rugged DuraFlex finish. It also features a full screen-backed steel grille designed into a rugged copolymer bezel for maximum component protection. For comfortable portability the EON518S subwoofer features 2 large ergonomic rubber grip handles. Need mobile sound at a parade or in a remote location like a wedding reception at the beach? AVIVA rents Honda EU 2000i generators for any remote power need from cliff side wedding ceremonies to camping vacations. Powered speakers and a mic. Add audio mixer if music and voice are both on the agenda.